More than clinical knowledge. More than medical expertise. The people of Adventist Health Southern California Region are inspired by something even greater – sharing God’s love, restoring lives and healing communities. Join us on a truly rewarding journey where professional enrichment and personal fulfillment come from a higher source. AH Southern California Offering Nurses up to $12K in Sign-On Bonuses! 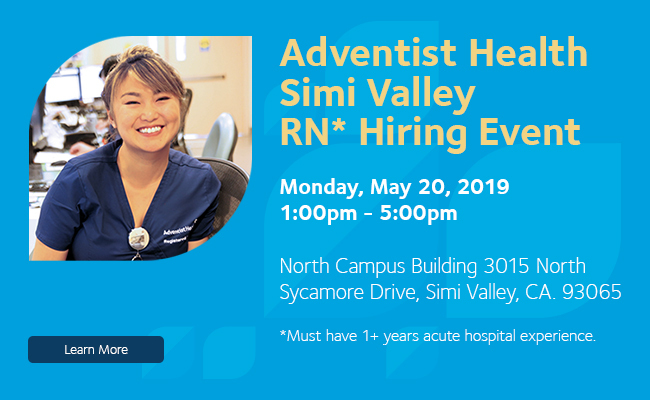 Adventist Health Southern California has Great Opportunities and Benefits for Specialty Nurses. Offering up to $12K in Sign-On Bonuses! Our commitment to quality healthcare is rooted in our heritage, which dates back to 1866 when the first Seventh-day Adventist healthcare facility opened in Battle Creek, Michigan. These were dedicated pioneers promoted the at-the-time radical concepts of proper nutrition, exercise, and sanitation. Adventist Health Glendale Partners with Pfizer on Innovative Drug Research! Adventist Health Glendale’s Office of Integrated Research (OIR) partners with pharmaceutical companies to bring cutting-edge treatments to our community! Principal investigators are local AHGL physicians who work with the OIR and together they make up the research team. The research team is dedicated to improving the health of our community through excellence in innovative clinical research and providing promising new treatments that would otherwise not be widely available to the public. Four renowned medical centers of hope and healing. A single unifying spirit of service. This is Adventist Health Southern California Region. By bringing together these four Adventist Health hospitals – Glendale, Bakersfield, Simi Valley and White Memorial – we’re able to provide care for hundreds of thousands of lives while offering truly fulfilling careers for thousands of compassionate individuals. Adventist Health Glendale has been a shining light on the hill to the people of Glendale and nearby communities since 1905. Adventist Health Simi Valley is a 188-bed facility that has been elevating the health and the spirit of Simi Valley for more than 50 years. Adventist Health White Memorial has been a treasured resource for the communities in and near Downtown Los Angeles since 1913. Adventist Health Physician Network (AHPN) is a network of providers serving the Los Angeles and Ventura with 101 providers and 195 employees.